2017 September home sales are up 10.9% over Sept 2016, for 30A Homes, with 79 sales totaling $107,339,976 reported by Realtors in Emerald Coast Association of Realtors. 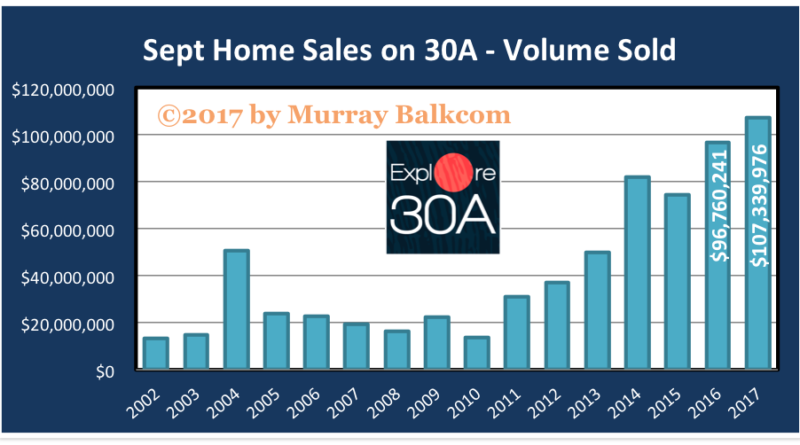 This sets a new record for 30A home sales on 30A for September. The second best September on record was 2016 with with 77 homes sold totaling $96.7 million. The median selling price was up 13% over Sept 2016, at $800,000. As a reminder, the median price is the number where half of the sales are above that number and half of the sales are below that number. Average sold price for 2017 was reported as $1,358,733. 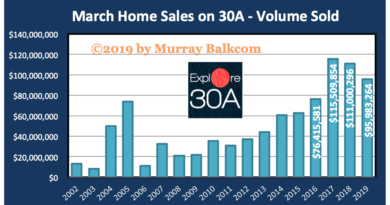 In the chart above, you can see how that compares to what many people refer to as our “peak of the market” in 2006, when only 13 home sales were reported on 30A, totaling $22.9 million. Homes are selling faster as shown by the average days on market dropping from 150 to 127 days. On average, the sold price to list price ratio for Sept 2017 was 93%, which is down from 95% in Sept 2016. That indicates that listings are being priced a bit higher than market value on average. Inventory has been creeping up slowly over the last three years and we are now at 698 homes on the market. 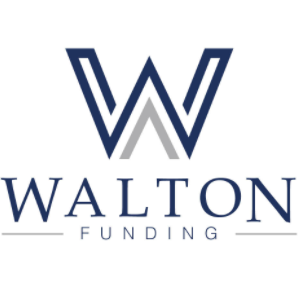 With 79 homes sold in September 2016, we are at 8.8 months of inventory. With the close of September sales, we are also closing out the 3rd quarter of 2017. 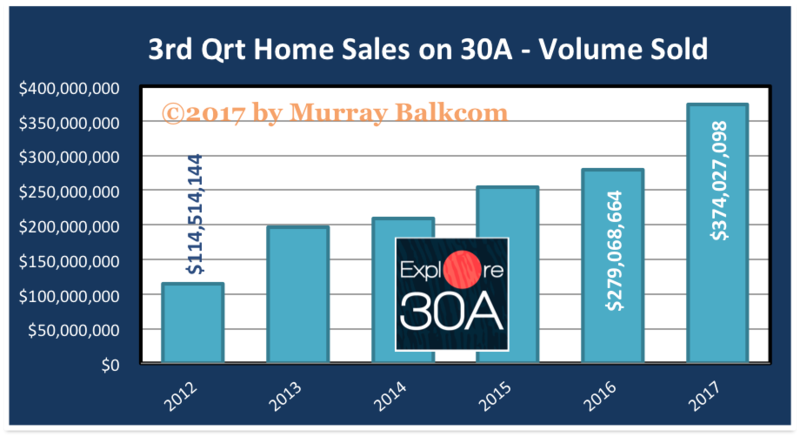 Below, the chart compares 3rd quarter home sales on 30A going back to 2012. 2017 3rd quarter sales are up over 200% in five years. If we compare the growth of 2017 compared to 2016, we see a 34% growth in the dollar volume of home sales in 30A. We should end the year above 2016 for annual sales. 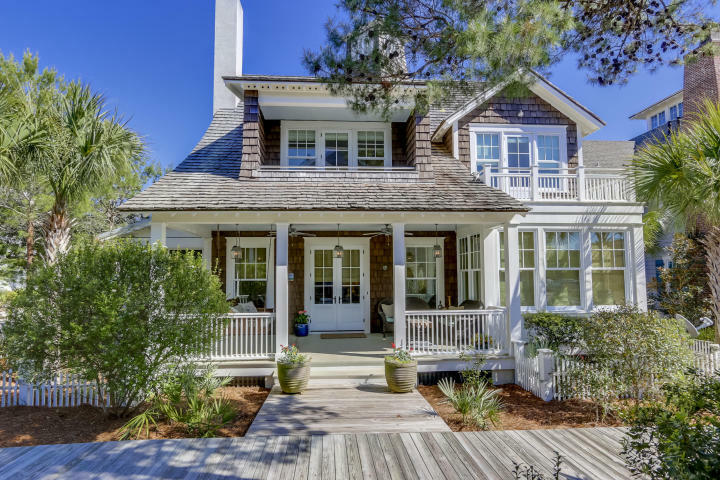 Explore Homes for Sale on 30A. Explore30A.com is your best source for real estate on 30A. Data source is Emerald Coast Association of Realtors and deemed to be accurate by not guaranteed.